Made from naturally occurring crystallised mineral salts from Thailand. This deodorant is hypoallergenic and fragrance free. 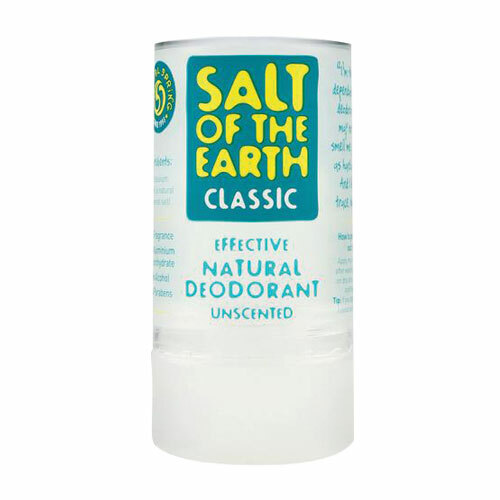 This multi award winning deodorant is a natural crystal deodorant made from pure potassium alum. Potassium alum is a natural mineral salt that inhibit the growth of odour causing bacteria leaving you feeling fresh and scent free. The classic crystal deodorant does not contain any of the antiperspirant ingredients that cause white marks on your clothes. Perfect for vegetarians and vegans. Suitable for ages 6 and up! Apply to damp skin after washing. For use on dry skin, wet the crystal and then apply. Below are reviews of Salt of the Earth Classic Crystal Deodorant - 90g by bodykind customers. If you have tried this product we'd love to hear what you think so please leave a review. I never considered the chemicals in usual deodorants until I came across this. Works great, no sweat, no smells however hard I work, and no itching or marks like before. 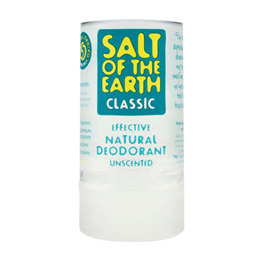 Excellent alternative to chemical deodorants. I have been using this brand for a few years and it has never failed. After shower, while still wet, apply for about 15 seconds under each arm. Brilliant stuff. Been using for years; no smell, no sticky and lasts for ever - well almost! Never had this fall apart. Very good product, I've been using rock crystal for years and i am very pleased with the result. I will score it only 3 stars only because of the package - after a while it came apart, very annoying when you use it every day. Great natural product. Quite a few brands of natural deodorants out there but this one doesn't split apart as often as I've had other brands of rock crystal do.